Away Home & Pet Care is a locally owned and operated FULL TIME pet sitting and dog walking business serving the Ogden, UT and Columbia, SC metropolitan areas. Because this is our livelihood, we try very hard to go ABOVE AND BEYOND to ensure your dog’s safety while walking in the neighborhood. Sure, every dog walker in the world will tell you they place a high emphasis on the safety of the dogs they walk. At Away Home & Pet Care, not only do we claim that your dog’s safety is of the utmost concern, we prove it. Here are two ways our dog walkers ensure the safety of your pooch while they’re out and about. 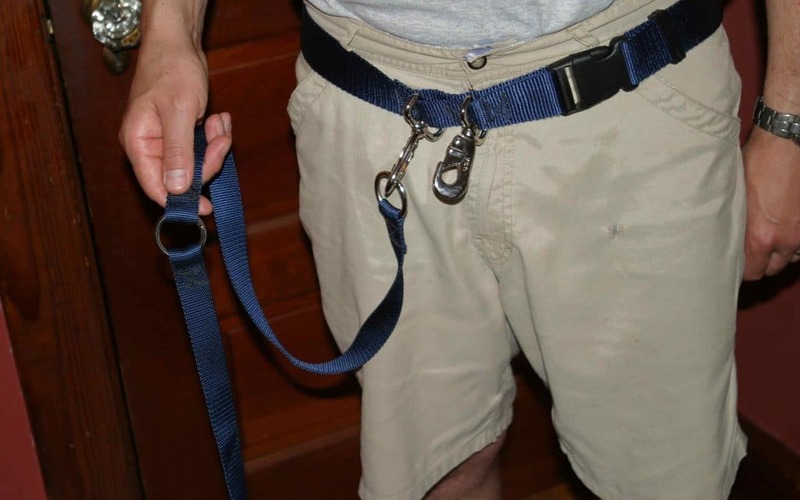 Most dog walkers attach a leash to a dog’s collar and simply grip the dog’s leash in their hand. Simply put, this just isn’t enough. Dogs can be unpredictable and we hear stories all the time about how dogs are lost when the dog walker drops the leash or if the dog takes off running. To prevent this from happening, your dog’s leash is attached to the dog walker’s waist via a specially designed waist harness. If your dog walker accidentally slips and falls, or if your dog suddenly decides the most important thing to do at that moment is to go chasing that ever-elusive squirrel, having your dog tethered to your dog walker’s waist ensures the dog and walker will not become separated. In the first step we addressed how we aim to prevent a dog from becoming lost while under the care of our dog walkers. At Away Home & Pet Care, we’re all about contingency plans and are constantly asking ourselves “But what if?”. For example – what if, despite the fact that your dog and dog walker are literally joined at the hip, your dog still manages to get away from the walker? We’ve got you covered! At the beginning of each walk, your pet sitter will attach a GPS tracking device to your dog’s collar. Though it has never happened, should your dog and dog walker become separated, you can rest easy knowing your dog walker can track the exact location of your dog thereby ensuring a quick reunion. So there you have it – two simple, yet highly effective tools we use to keep your dogs safe. Both of these examples are just a vast array of processes and services which separates a hobbyist pet sitter from a true professional. About Away Home & Pet Care: In business for over 15 years, and with hundreds of satisfied pet clients, Away Home & Pet Care is one of the most trusted pet sitting and dog walking companies in the Ogden, UT and Columbia, SC metropolitan areas. We know how important it is to fully trust your furry family member’s caregiver. You can rest assured knowing that Away Home & Pet Care is more than just a pet care business – we are an integral part of our client’s families. We promise to never take this incredible responsibility lightly.